I've found some really fun things for our home lately and I wanted to share a few with you! My first find was at IKEA... of course. ha! I picked up a few sets of 6 glasses for only $2.99 each! Woot, woot! I'm not sure if this was just a limited supply that was at my IKEA, or if they are everywhere. I picked up some of these cute blue cups too, because I loved the color, and they were 'el-cheapo! gah! You gotta love those dirty fingernails. ha! 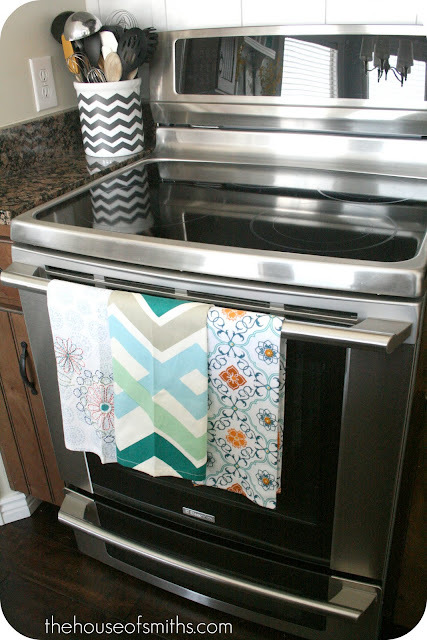 I visited our local kitchen supply store in town called Orson Gygi and picked up some of the most adorable decorative kitchen towels for only about $4-$6 bucks each! PS. I la-la-la LOVE this place! My last great find is one that was a TOTAL splurge, I have to admit. I was wandering around Z-Gallery a few months ago, just doing my normal Oooing and Ahhing, when all of a sudden this absolutely fabulous throw JUMPED right into my arms and begged for me to buy it. :) .... or at least that's what I told Cason. ha! 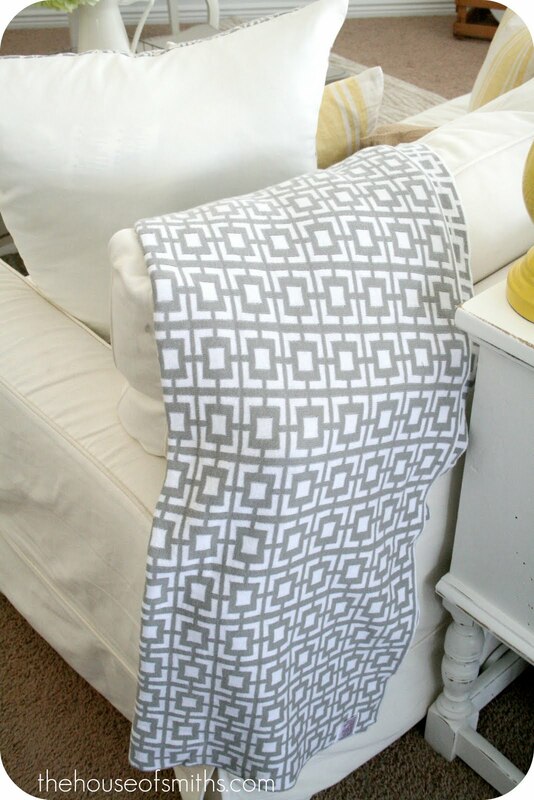 Seriously, how could I live without this geometric grey goodness? So home it came to live on my couch, for now. And while I was on a roll, I also picked up these awesome plates and small aqua birdhouse, to complete my kitchen shelf ensemble. I'm in love with the modern patterns, yet trendy color schemes. So that's it! Just some great, stylish, fun finds that I wanted to share! What have you found lately? Anything GREAT!? so wish those towels were on their site - that middle towel is exactly what i've been looking for! it wouldn't by chance happen to have a tag with the manurfacturer on it, would it?? Love all the patterns, textures and colors. You have a great eye! Love Love Love your finds! Lucky girl :) I found some awesome antiques that I'm in LOVE with! You can check them out if ya want! Will we be seeing a full shot of those fabulous kitchen shelves? You're making me want to hit up Ikea so badly! Those glasses are too cute! I have, on SEVERAL occasions, almost bought that exact same throw from Z Galerie! It's so gorgeous, who could resist?! wow great finds! Those tumblers are adorable and the towels are by far the prettiest kitchen towels that I've even seen. I love all your finds!! Especially that throw!! You have a great taste! Fantastic finds!! I am so in love with the beautiful turquoise of your bird house!! 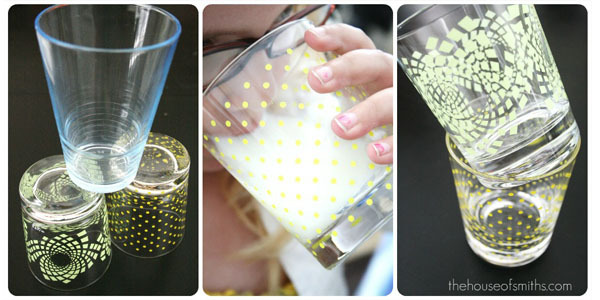 and I agree, IKEA is amazing...must go and take a "boo" to see if ours carries those great tumblers!! Love it all! I need you to come shopping with me.....I never find what I'm looking for! I love the z gallery birdhouse adorable!!! Thanks for sharing your beautiful finds with us. I love your style !! I LOVE the birdhouse, utensil holder and towels, SOOO cute! :)how fun! 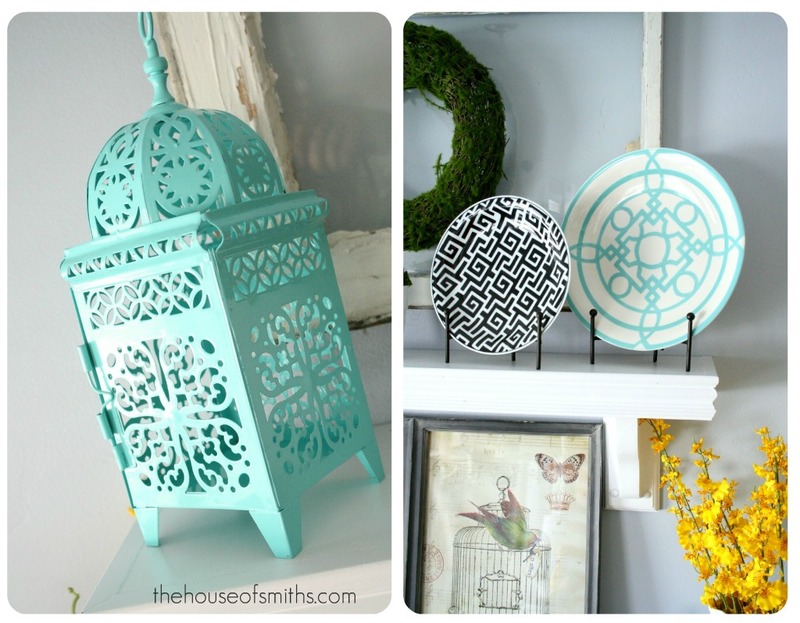 I think I need that turqoise birdcage. Bad!! You just inspired an impromptu stop at Ikea! Ps. Where did you find those cute yellow flowers? Oh girl I LOVE all the new decor!! Great finds! Love the chevron canister - where did you find that? Cute! I love ZGallerie! I just moved to Raleigh from Indianapolis (we didn't have one there) and I walked into a Zgallerie for the first time ever this week and it put me in the most amazing mood! Finally or store with gorgeous furniture and decor at reasonable prices!! These really are some great finds. I love the aqua lantern. Where did you find the utensil holder I spy in the picture? I love it. sorry, i'm a little slow...figured out the cute plates are from z gallery too. so cute!! It was so fun chatting with you at QBM! You made my day with your sweet and genuine comment...and here I was thinking....I wonder if she will remember who I am! haha....AND...I can't figure out how I missed that you 'belong'. I never saw the temple pic on your blog....for some reason I thought someone told me you weren't a member. So sorry. The funniest part is I thought at one time....she would be a totally perfect mormon crafty mom. Anyway...I felt stupid when I realized it. Hope BlogHer was fabulous and I'm so glad you stopped by. Hope to chat soon!! Oh.... lots of pretties. Love the towels, the throw and especially that aqua lantern. Did you find it at Z Gallerie too? Love those towels!!! Super cute patterns! And the throw jumping into your arms....totally believable!! Great finds!!! I LOVE IKEA!! So much so I wrote a blog post dedicated to them entitled Ode to IKEA. I'm been reading your blog for a while now and I never got around to posting a comment. I just wanted to say I love your blog, it's so inspiring and you've given me a ton of great ideas especially the faux base board, my husband liked it too. I, too, would love to know if you know the manufacturer of the towels. They are wonderful! Also, I so, so love the pic under the mantel of the bird and birdcage? Willing to tell where you got it? Ooh, I really love the chevron patterned utensil holder! Where did you get it?